I continue my series on early Christian history. The New Testament writing, Acts of the Apostles, has functioned as the earliest history of the church. 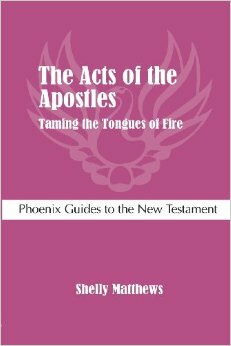 But at most, it is “idealized history.” Shelly Matthews of Brite Divinity School speaks about the rhetorical strategy of Acts in her new book, The Acts of the Apostles: Taming the Tongues of Fire (Amazon). She speaks with me on Religion For Life about how the author of Acts idealized Paul and tamed the egalitarian Jesus movement to make it more palatable to the elite reader. Thursday, February 13th at 8 pm on WETS, 89.5. Saturday, February 15th at 1 pm on KZUM, 89.3. Sunday, February 16th at noon on WEHC, 90.7. Sunday, February 16th at 2 pm on WETS, 89.5. Monday, February 17th at 1 pm on WEHC, 90.7. Wednesday, February 19th at 6:30 pm on WEHC, 90.7. Stewart Harris, Which Bible, Which God?